Feeling the demands for increased connectivity onboard your aircraft? Are you deterred by the costly equipment and lengthy installation times necessary to upgrade your fleet? Or perhaps you have already endured the restoration costs and logistics of retrofitting your leased aircraft? Thankfully, Carlisle Interconnect Technologies has the answer – a universal SATCOM solution that can be seamlessly installed on any aircraft and reaps significant time and cost savings. CarliseIT, in partnership with Saint Gobain Performance Plastics, now offers multiple ARINC 791 solutions for Ka-band, Ku-band and Tri-band SATCOM installations. The complete package contains the CarlisleIT ARINC 791 compliant adapter plate, provisions for Outside Airframe Equipment (OAE), and intercostal kits required for both retrofit and line fit installations on transport jet aircraft. 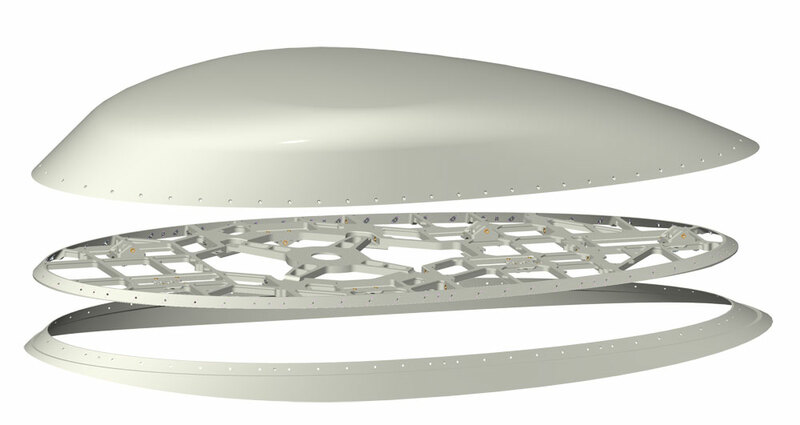 Installation fittings on the adapter plate are adjustable to cover the complete range of aircraft frame spacing, while providing discrete interface loads to the fuselage. The aerodynamic skirt follows the fuselage curvature without requiring a large installation doubler, sealants, or additional fasteners through the aircraft skin. The CarlisleIT ARINC 791 adapter plate solution fulfills the requirement for a standardized installation, easier maintenance inspections, and overall lower cost of ownership. Conformance to the ARINC 791 standard also helps futureproof the SATCOM installation, and makes upgrades to next generation antennas and SATCOM system equipment easier and faster with commonality across entire fleets. Designed to support a wide range of SATCOM systems, ARINC 791 is preferred by aircraft manufacturers for line fit installations. CarlisleIT is striving to help airlines and system providers improve theirs speed-to-market and deliver enhanced next generation SATCOM connectivity to today’s airline passengers.